The word innovation is often associated with complex new devices that will disrupt current practice. But strategic tweaks or additions to existing products can sometimes have just as significant an impact. The DISK system--which stands for dispenser integrated system kit--is one such example. 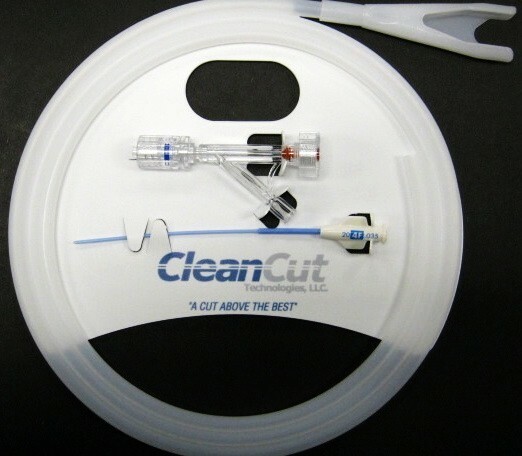 The bronze winner in the Medical Product Packaging, Graphic Instructions, and Labeling Systems category of the 2014 Medical Design Excellence Awards combines two products--a clipless dispenser for catheters and guidewires, and a die-cut backer card--into one. "Sometimes they like to see a better mouse trap," says Tim Bell, partner and president at Anaheim, California-based CleanCut Technologies, manufacturer of the DISK system. "We just took a couple of things, put a twist on it, and made it better. You don't have to reinvent the wheel. Sometimes you just have to make it better." The idea for the original dispenser was born about 13 years ago in response to a client's desire for a better dispenser for catheters and guidewires. Conventional dispensers designed with clips to hold the tubing together have several shortcomings, according to Bell. The clips can cause a puncture in a sterile pouch, for example, which compromises product safety. They can also fall off during shipping or use, and are not consistently round or symmetrical, which can make loading a device into the coil difficult, Bell explains. Designed with these current shortcomings in mind, the DISK system features a clipless dispenser that is thermally bonded to a high-density polyethylene die-cut backer card. In addition to containing the dispenser, the card also can hold components such as syringes, luers, or needles--effectively transforming the package into a procedural kit. Packaging the two products together reduces the material needed, which, in turn, cuts production costs, according to Bell. For the end-user, the main benefit is a shorter prep time during surgery. "It goes together like peanut butter and chocolate," Bell says about the card and the dispenser. "They are just meant to go together. It's a natural fit, a natural concept, and a natural evolution. Those two items together are an even better product than the two items by themselves." CleanCut's patents currently prevent other companies from creating a clipless dispenser or bonding the dispenser together with a die-cut card. But the idea was not completely unique; before CleanCut invented its DISK system, other companies had tried--and failed--to create similar packages, according to Bell. "We were told that people have been trying this for years and they couldn't figure out how to do it," he says. "They said they had Harvard engineers trying to figure this out. Sometimes you have to be good. Sometimes you have to be lucky. I think it's a little bit of both." Interested in medical packaging design? Download the white paper, "Critical Considerations When Designing Medical Packaging." Camilla Andersson is a contributor to Qmed/MPMN.